Bartolo di Fredi (c. 1330 – January 26, 1410) was an Italian painter, born in Siena, classified as a member of the Sienese School. 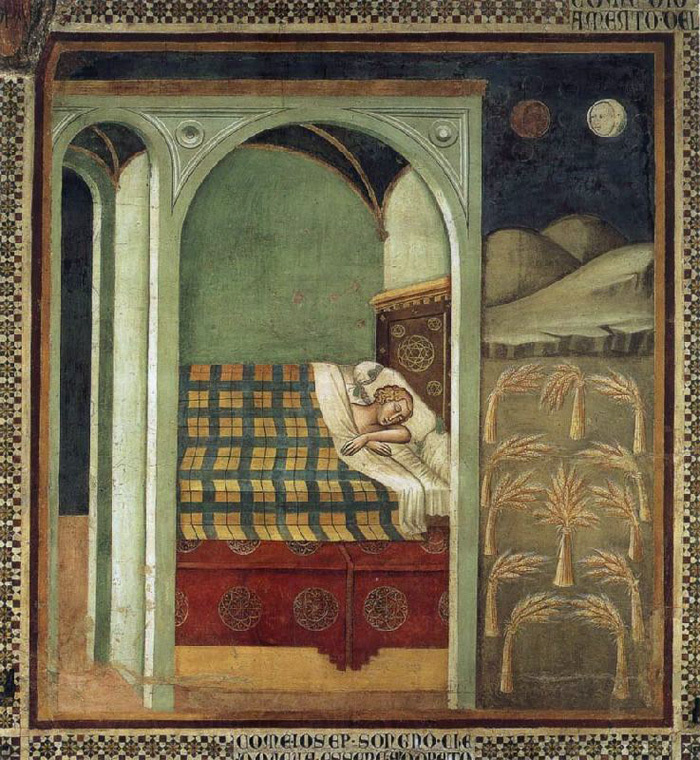 Bartolo di Fredi was one of the most popular masters in Siena in the second half of the fourteenth century. He had a large studio and was one of the most influential painters working in Siena and the surrounding towns in the second half of the fourteenth century. He registered in the Guild of that city in 1355; he had several children, who all died before him, with the exception of Andrea di Bartolo. He was the companion of Andrea Vanni from 1353, and helped decorate the Hall of Council at Siena, in 1361. In 1362 he went to San Gimignano, where, by 1356, he had painted the entire side of the left aisle of the Pieve with scenes drawn from the Old Testament. In 1366 the Council of the city of Gimignano ordered a painting, representing Two Monks of the Augustine Order to be placed in the Palazzo Pubblico, in order to commemorate the settlement of some disputes which had long existed between that order and the city. In the early part of 1367 he returned to Siena, and was employed with Giacomo di Mino in the decorations of the cathedral. In 1372 he rose to a position in the government of the city, and was sent to welcome the new Podesta, on his approach to Siena. In 1381 he was himself made a member of the Council, and in 1382 he executed the Descent from the Cross now in the Sacristy of San Francesco, Montalcino. The same church also possesses panels painted by him containing the Baptism of Christ figures of SS. Peter, Paul, and Francis, and five scenes from the life of St. Philip of Montalcino. In 1389, Bartolo, assisted by Luca Thome, painted the altar-piece for the Shoemakers' Company, in the Cathedral, and continued from that year until his death to furnish altar-pieces for the cathedral and other churches of Siena, which have now all disappeared. His style is marked by the rejection of the concrete figures associated with Pietro Lorenzetti to instead favor flatter decorative otherworldly compositions in the manner of Simone Martini and Duccio. He combined a spirit of fantasy with anecdotal details. The Honolulu Academy of Arts, the Los Angeles County Museum of Art, the Louvre, the Metropolitan Museum of Art, the Musée des Beaux-Arts (Chambéry, France), the Musée du Petit Palais (Avignon, France), Museo Civico e Diocesano d'Arte Sacra (Montalcino, Tuscany), the Museum of Fine Arts, Boston and the University of Virginia Art Museum are among the public collections having paintings by Bartolo di Fredi. This altarpiece The Adoration of the Magi was commissioned for the cathedral of Siena. The Adoration of the Magi exemplifies a late medieval trend toward using the background to detail the travels of the Magi -- in this case including their colloquy with Herod in Jerusalem. The panel is characterized by a lively dynamism like in Lorenzetti's paintings. The only tranquil detail is Mary sitting with the Child on the right side. The three kings arrive with a big accompaniment from the left. The big striped hats in the hands of the members of the accompaniment is well known from the St Martin fresco cycle of Simone Martini in Assisi. The background scene is a reference to the long journey of the kings between cities and mountains. The walled city is Siena with the black and white striped Cathedral and the bell-tower. No organic connection can be observed between the foreground and background. Bartolo di Fredi was an eclectic artist, but his work shows imagination and a discriminating approach to his sources. In the Coronation ofthe Virgin in Montalcino, for example, he worked in a style close to that of the late work of Simone Martini, with harmonious transitions or colour blended into delicate gold graffito and vibrant, yet balanced, linear rhythms. The polyptych of the Coronation of the Virgin, signed and dated 1388 by Bartolo di Fredi, was executed for a chapel in the church of San Francesco in the town of Montalcino. The painter appears to have had a number of other connections with Montalcino, both as an agent for the Sienese government (in 1375 and 1376) and as a painter - securing at least four major commissions in the 1380s and 1390s. The number of works that have survived by Bartolo di Fredi, registered in the Breve de' pittori senesi del MCCCLV, is considerably fewer than those cited in the documents. In 1353 Bartolo di Fredi set up a workshop with Andrea Vanni. He held various public positions, as did the majority of artists of his generation who took part in the running of the Sienese Republic. In 14°7 he made his will in favour of his only son, Andrea di Bartolo, who was an important miniaturist and painter. He died in 1410 and was buried in the cloister of San Domenico in Siena. Bartolo di Fredi's first signed and dated work is a Madonna della Misericordia painted in 1364 (Museo Diocesano, Pienza), which was influenced by Lippo Memmi's Madonna dei Raccomandati in Orvieto. Other important influences on his art came from Niccolo di Ser Sozzo and ]acopo di Mino del Pellicciaio. His most famous frescoes were executed in 1367 in the Collegiata in San Gimignano on the north wall of the nave. The influence of the Lorenzetti brothers is evident and there are some direct quotations from their works, yet the frescoes still bear the imprint of Bartolo di Fredi's personal style. In the Earthquake in the House of Job, a total lack of depth results from an absence of three-dimensionality of form and from all the action taking place in the foreground. Lucignano is a fortified town in the Valdichiana. Annexed to the Town Hall is the church of San Francesco, a fine example of gothic Franciscan basilican architecture with the floor plan in the shape of an Egyptian cross. The construction was probably started in 1248 and finished in 1289. Originally the church walls were completely frescoed but only fragments remain. Attributed to Bartolo di Fredi and Taddeo di Bartolo, they show moments in the life of Saint Francis. Il Trionfo della Morte, the Triumph of Death, is the title of the splendid fresco situated on the wall above the first altar on the right hand side of the nave. It shows the precariousness of human life on earth. The Duomo or Collegiate Church of San Gimignano (Santa Maria Assunta), situated on the west side of the Piazza del Duomo, is a fairly rare example of Tuscan Romanesque architecture on the grand scale. The altars, chapels, friezes, frescoes and paintings with which it was filled were commissioned from the most famous artists of the day by the persons responsible for the Opera del Duomo, by public administrators and by private citizens. The church was originally a simple parish church that was transformed in 1056 into a Propositura (a parish church responsible for other smaller parish churches in the surrounding area) by Pope Victor II. In 1148, it was consecrated by Pope Eugenius III as he returned to Rome along the Via Francigena, and, in 1182, a papal Bull issued by Pope Lucio III granted it numerous privileges. In 1220 Pope Honorius III confirmed the Canonical Chapter’s privileges, and this was repeated by Pope Innocent IV did in 1241. This extraordinary attention given to the church by important religious dignitaries led the Proposto (the person responsible for the Propositura), Canons, and the municipality to make the church a more magnificient place of worship worthy of its reputation. It became a Basilica in 1232. In 1238, work to enlarge and embellish the church began and continued until the end of the 17 C. The Saints of San Gimignano such as St. Fina, St. Bartolo, St. Piero The Martyr and the Blessed Ciardo, were worshipped and celebrated in the church. Gimignano, the Saint and Bishop of Modena, has his remains and his altar here. Every year on 31st January (St. Gimignano Day) he is the object of special celebration. Canons, and Franciscan, Capuchin, Dominican and Augustinian friars preached from the pulpit of the church. Girolamo Savonarola preached in the Duomo in 1483. Several Cardinals were given the title of Proposto of the church, including Giordano Orsini (1146), Napoleone Orsini (1314), Francesco Carbone (1389), Francesco Soderini ( 1495) and Baldassarre Cossa who was elected Antipope in 1410 and removed in 1414 by the Council of Costanza. Inside the Duomo, there are many very beautiful frescoes. Along the walls in the left aisle, Bartolo di Fredi painted "Scenes from the Old Testament" and in the right aisle there are frescoes representing "Scenes from the New Testament", originally considered to be the work of Barna da Siena and recently attributed to the workshop of the Memmi. In the central nave, there are two famous wooden statues by Jacopo della Quercia standing on either side of the fresco illustrating the Martyrdom of St. Sebastiano by Benozzo Gozzoli. On the upper part of the central nave between the two doors, above the first two arches on the right and left hand sides, are Taddeo di Bartolo’s frescoes sof the Last Judgement. In the right aisle, next to the transept, is the famous Chapel of St. Fina built in 1468. It is the most precious work of art in the Duomo due to its elegant altar by Benedetto da Maiano and to its frescoes by Domenico Ghirlandaio representing on the right hand side "St. Gregorio foretelling St. Fina of her approaching death" and on the left hand side her "Funeral Rites". The church can be reached from the Porta St. Matteo by passing along via Cellolese. Its very simple façade still retains the characteristics of its original architectural style. The door in the main façade is not used as the entrance. Instead, the door on the right hand side is generally used to enter the church. The interior of the Church consists of a single large nave with three ogival apses. The roof is supported by a wooden framework. The construction of the Church of St. Agostino, with a single nave in Romanesque style with Gothic elements, began in 1280 and terminated on 31st March 1298 when it was consecrated by Cardinal Matteo D’Acquasparta. The Prior Fra Domenico Strambi was responsible for the building of the cloister in the second half of the 15 C and the decoration of the Church in Renaissance style. The Chapel of the Blessed Bartolo, whose mortal remains are kept in a marble monument sculpted by Benedetto da Maiano in 1495, is extremely interesting. 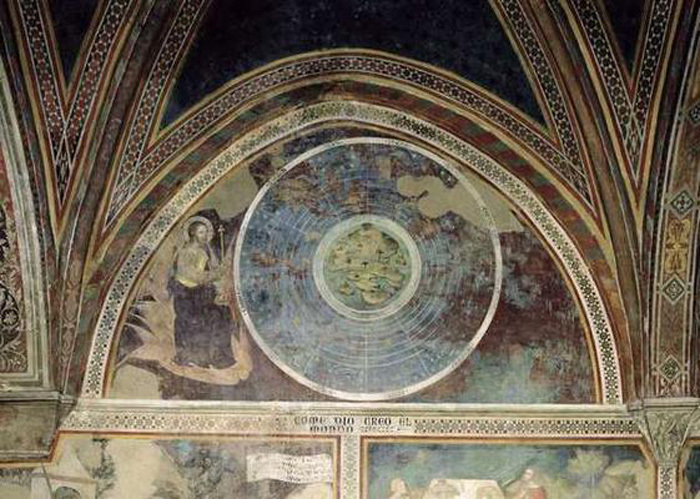 In 1500 Sebastiano Mainardi frescoed the chapel’s walls and vaults. Its terracotta floor is the work of Andrea della Robbia. The Coronation of the Madonna and the Saints, painted in 1483 by Piero del Pollaiolo, is located above the high alter. 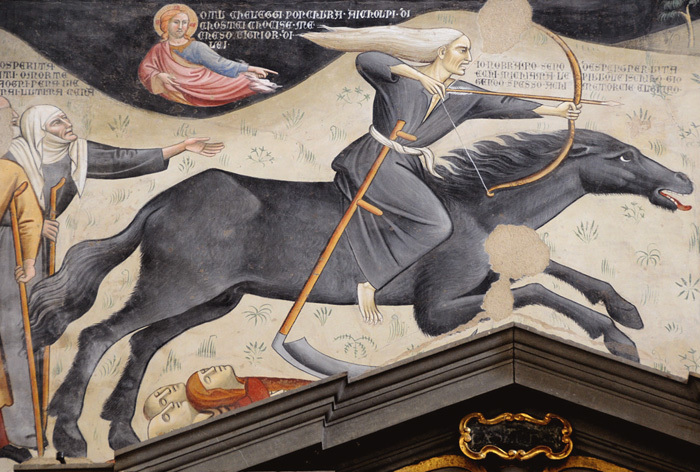 The frescoes in the chancel representing Episodes from the life of St. Agostino were painted by Benozzo Gozzoli between 1464 and 1465 with the help of two of his pupils, Pier Francesco Fiorentino and Giusto d’Andrea who also painted the votive fresco of St. Sebastiano. Other notable works of art in this church are the fragments remaining from a fresco by Bartolo di Fredi and a fresco showing the Madonna painted by Lippo Memmi in 1317, as well as the tablet representing The Madonna and the Saints painted by Fra Bartolomeo in 1530 and, in the sacristy, a wooden Crucifix dating from the 15th century. This page uses material from the Wikipedia article Bartolo di Fredi, published under the GNU Free Documentation License. Wikimedia Commons has media related to: Bartolo di Fredi. The Valdichiana is a lovely area blessed by a mild climate and its varied and interesting countryside is completely unspoiled. The region is marvellously compact and is characterised by a thermal basin which is among the most important in Italy. It is far from large urban centres, and its large forests create a healthy atmosphere which helps make the area one of the most pollution-free in Europe. It is also famous for its wonderful bread, wine and olive oil. The Valdichiana is the perfect place for visitors not only because of the beauty of the natural countryside and the gentleness of the climate but also for its well-preserved cultural heritage. This is still alive and present in the museums, the archaeological ruins, the monuments, the historic centres, and the countryside itself, all of which testify to an uninterrupted succession of cultures : Palaeolithic, Etruscan, Roman, Medieval and Renaissance. In addition to this there is the traditional hospitality of a people who know how to welcome visitors to this beautiful, green and fascinating area of Tuscany. At a height of 400 metres, the town dominates the valley below, on the borders of the provinces of Siena and Arezzo. Etruscan and Roman archaeological remains illustrate the importance of Lucignano as a strategic point of connection between the two cities. Its urban structure, composed of concentric elliptical rings, is one of the most singular of the entire Arezzo territory. We enter the old town centre through the San Giusto gate. We can then choose whether to visit the village starting from the left, proceeding along the "poor street", or Via Roma, lined with simple constructions of a mediaeval stamp, or from the right, along the "rich street" or Via Marconi, embellished by Sienese style Renaissance mansions. In Via Roma, on the left we can see the Cassero with its high Tower (fourteenth-century), built to a design by the Sienese Bartolo di Bartolo, opposite a loggia of Renaissance style, but actually built in the eighteenth century to a design by Andrea Pozzo. From here, we ascend slightly to reach the Collegiate church of San Michele Arcangelo, (late sixteenth-century) designed by Orazio Porta, with elliptical steps in front which complete the urban layout of the town. The interior houses interesting sixteenth-century works. A little beyond the Collegiate church we come to the Piazza del Tribunale with the Palazzo of the same name which later became the Palazzo Comunale (thirteenth-fourteenth century). From here we enter the Museo Civico which houses an interesting collection of paintings from the thirteenth to the sixteenth centuries (Bartolo di Fredi, Lippo Vanni, Luca Signorelli) and a magnificent reliquary in gold, silver and gilded copper in the form of a tree, known as the golden tree of Lucignano, and attributed to Sienese goldsmiths, Sienese and Florentine illuminators and Gabriello d’Antonio (fourteenth-fifteenth century). Next to the Palazzo del Comune is the Romanesque church of San Francesco, (thirteenth-century), with a facade adorned with a Gothic portal and rose window. The interior houses frescoes by Taddeo di Bartolo and Bartolo di Fredi (Scenes from the Life of St. Francis, The Triumph of Death, fifteenth-century). The itinerary can continue with a visit to the Torre delle Monache, (eleventh-twelfth century), the characteristic lanes, the walled gate (reopened after lengthy restoration), and outside the old town centre, the Medici Fortress, built for Cosimo I and never completed, the Renaissance Sanctuary of the Madonna della Querce, built to a design by Giorgio Vasari, and all the surrounding countryside which provides a scenographic backdrop to the walled town.